WASHINGTON/ANKARA (Reuters) - President Donald Trump said on Tuesday Saudi authorities staged the "worst cover-up ever" in the killing of prominent journalist Jamal Khashoggi this month, as the United States vowed to revoke the visas of some of those believed to be responsible. Trump spoke hours after Turkey's president, Tayyip Erdogan, dismissed Saudi efforts to blame Khashoggi's death on rogue operatives. Erdogan urged Riyadh to search "from top to bottom" to uncover those behind Khashoggi's death in the Saudi consulate in Istanbul on Oct. 2, an incident that has sparked global outrage and strained relations between Riyadh and Washington. Trump said the killing and subsequent cover-up by Saudi Arabia were "a total fiasco." "There should have never been an execution or a cover-up, because it should have never happened," Trump told reporters. He said he had spoken on Monday with the crown prince who denied having anything to do with Khashoggi's killing. "Bad deal, should have never been thought of. Somebody really messed up. And they had the worst cover-up ever," Trump told reporters at the White House. Trump's comments in recent days have ranged from threatening Saudi Arabia with "very severe" consequences and mentioning possible economic sanctions, to more conciliatory remarks highlighting the country's role as a U.S. ally against Iran and Islamist militants, as well as a major purchaser of U.S. arms. Trump did not give his views on who was ultimately responsible. But Secretary of State Mike Pompeo said the United States had identified some of the Saudi government and security officials it believed were involved in Khashoggi's murder and would take appropriate actions including revoking U.S. visas. "As we continue to develop our understanding of the individuals that were responsible for this, not only those who executed it but those who were connected to it, the world should know that we intend to hold those individuals accountable when we develop this fact set," Pompeo told reporters. "These penalties will not be the last word on this matter from the United States," Pompeo said, although he emphasized as have other senior U.S. officials, the importance of the U.S.-Saudi relationship. "Neither the president nor I are happy with this situation." As the crisis unfolded over the past three weeks, Saudi Arabia changed its tune on Khashoggi. Riyadh initially denied knowledge of Khashoggi's fate before saying on Saturday he was killed in a fight in the consulate, an account met with skepticism from several Western governments, straining their relations with the world's biggest oil exporter. Saudi Arabia has detained 18 people and dismissed five senior government officials as part of an investigation into Khashoggi's death. One of those fired includes Saud al-Qahtani, a top aide who ran social media for Prince Mohammed. According to two intelligence sources, Qahtani ran Khashoggi's killing by giving orders over Skype. "The Saudi administration has taken an important step by admitting to the murder. From now on, we expect them to uncover all those responsible for this matter from top to bottom and make them face the necessary punishments," Erdogan said in a speech in parliament. "From the person who gave the order, to the person who carried it out, they must all be brought to account," Turkey's president said. "In terms of what we ultimately do, I'm going to leave it very much - in conjunction with me - up to Congress," Trump said, adding he would like a bipartisan recommendation. A day before Khashoggi's death, agents arrived from overseas and began to scout locations, including the Belgrad Forest near Istanbul and the city of Yalova to its south, Erdogan said. Police have searched both areas for evidence of Khashoggi's remains, Reuters has reported. 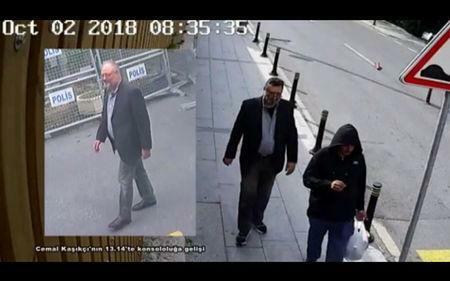 On the day Khashoggi arrived for his appointment and was later killed, the hard disk in the consulate's camera system was removed, Erdogan said.